Click here to watch an important video. We find ourselves at a time when our industry is undergoing tremendous change. There is one and only one organization whose sole purpose is to enhance and maintain a favorable business environment for the insurance industry. 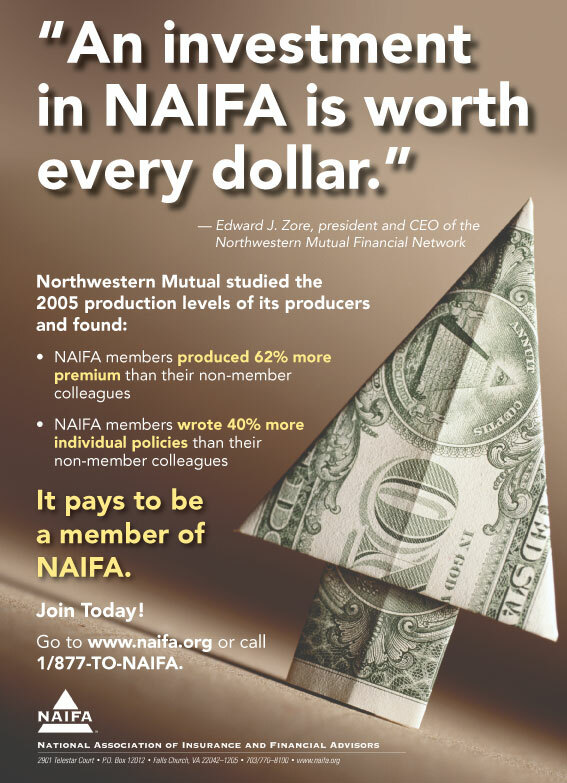 It is imperative that all agents and managers support NAIFA as it works to preserve their livelihood. Failure to do so is tantamount to “career malpractice”. The first organization I joined 16 years ago as I entered our business was the National Association of Insurance and Financial Planners. Today it would be hard to measure the effect that my membership has had on my career, because it has been immeasurable. To have talked one-on-one with John Savage and many industry greats will never be forgotten. Every agent who believes in our business and receives income from the sale of insurance should be a member of Arizona ALU. I have been a member of the association since the day I entered our business and was a founding member of the National Association of Insurance and Financial Advisors. NAIFA-Arizona has contributed immeasurably to my success in many ways and continues to be a force for good in behalf of agents and the public. It should go without saying that all agents become members of NAIFA-Arizona. There is no other organiza-tion that represents the agent and our industry so professionally and so well. I have been a member of the NAIFA-Arizona since I started in the business 16 years ago. Membership in the association helps me to keep current on legislative issues as well as keeping me abreast of new trends in our industry. NAIFA-Arizona: What’s In It For YOU? LUTC courses and other discounts on cutting edge education seminars. Interacting with fellow agents provides an opportunity to obtain unique perspectives and experiences/problem solving. “The Advisor,” NAIFA’s magazine packed with timely and informative articles and proven, successful sales ideas. The Life Program (Life Insurance Foundation) whose mission is to conduct public relations campaigns that enhance the image of insurance agents. Day on the Hill when members from around the state speak one-on-one with legislators and discuss issues facing the industry. NAIFA-Arizona has an impressive legislative record, beneficial to both the insurance buying public and the agent. Studies indicate customers prefer to deal with one agent for most of their insurance needs. Let NAIFA prepare you to meet that challenge. Issues of The Advisor feature a number of articles specifically dealing with multi-line concerns. You can also network with other insurance agents who can provide leads for your other lines of insurance. GAMA is dedicated to the advancement of our members through programs and services that raise both the level of competence and the professionalism of agency management. Community service projects conducted by insurance agents from across the state and country demonstrate in a tangible way the insurance agent’s involvement in important social issues critical to our industry and our nation. Real Life – Getting the word out on the REAL LIFE stories of agents across the country on how the industry affects the lives of the people they serve. Membership discounts let you save on resources to help make your business boom. NAIFA members earn median first year commissions of almost $20,000 more than non-members! Figures from a 1993 LIMRA report. Leadership is one of the unique values of being a member. Get involved. Join the experience. Doctors join their medical associations, lawyers their bar associations, and insurance & financial advisors join NAIFA. They join professional associations to show dedication and support for their industry. Clients want to do business with ethical and knowledgeable individuals. Membership in your Association identifies you as a professional who places top priority on client welfare and professional ethics. The National Association of Insurance & Financial Advisors, founded in 1890, is a federation of state and local associations. A highly experienced professional association in the industry, dedicated to improving the business environment of those engaged in life underwriting and the sale of other related financial products. 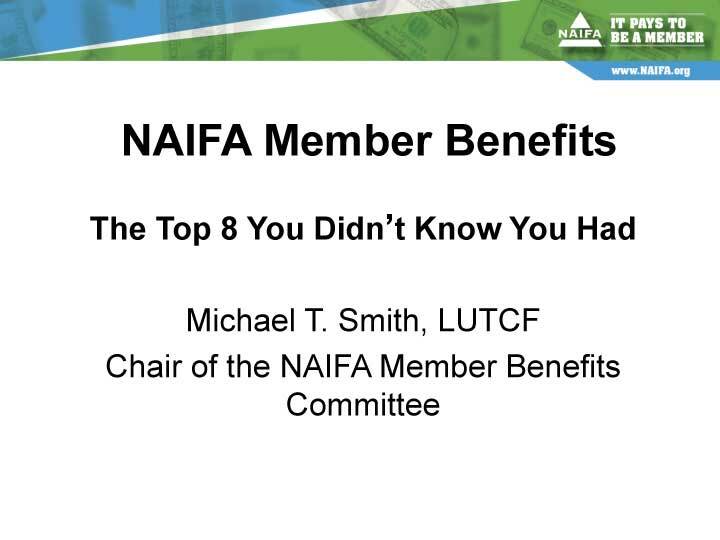 Local association members say there is no other industry association having as many resources as NAIFA. Membership will increase your bottom line. How? National, state and local associations offer benefits which translate into a higher persistency rate, more productivity and more earnings. Your local NAIFA Association provides you with income-building and money-saving ideas and resources. INFORMING agents of market innovations and critical industry developments. PROMOTING the reputation of the agent as a professional advisor. ADVOCATING the agent perspective to government, consumers and media. To receive information on membership please click on “Membership Information” below and type “Please send me information on membership.” Please include you complete name and mailing address.